Are you ready for some dogsled racing? The 2015 #Iditarod started today, the annual 1,000 mile dogsled race from Anchorage to Nome. Today was the "ceremonial start"; on Monday the real race starts with the "restart", which this year has been moved all the way North to Fairbanks, to ensure enough snow and good trail conditions. 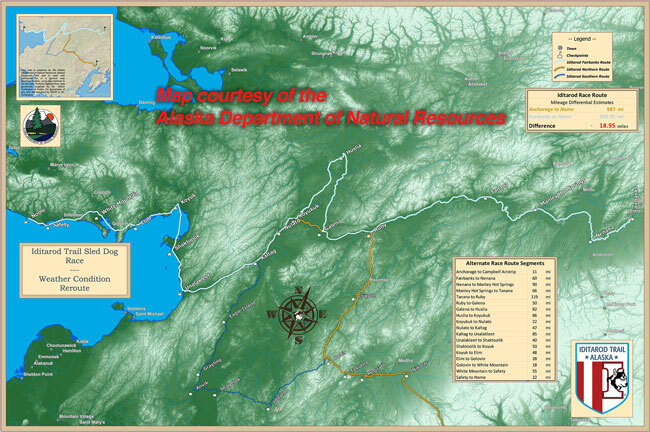 The first part of the route is entirely new, from Fairbanks to Ruby. Ruby and Galena are checkpoints in the usual Northern route*, but then a new leg has been added up to Huslia, and down through Koyukuk before joining the usual Northern route at Nulato. Ex-competitive musher Sebastian Schnulle will be blogging about the race; he posted this detailed note from Tom Huntingon about the new route. * The race alternates between a Southern and Northern route; the usual Northern route is in orange, and the Southern route is in blue. This was supposed to be a Southern year, but the weather has not cooperated. From what I've read the mushers are pretty excited about this change. The conditions will make for great racing, it will avoid some of the sections early in the old route which became treacherous with lack of snow and too much ice, and it will take the race into some beautiful wilderness. As far as changes to strategy; the route checkpoints are a little further apart, which means mushers may decide to camp and rest along the trail. At least we'll have GPS trackers so we can follow the action. If you're not a fan, here's the high line: Each musher starts the race with a team of sixteen dogs and must finish with at least five dogs. (Dogs are typically "dropped" at the various checkpoints, due to injuries or because they are tired or under-performing; every dog is examined by a veterinarian at every stop.) Each team must make one 24-hour stop along the way, and two 8-hour stops; when and where to take stops is a key point of strategy. There are seventy-nine teams in the race (the most ever), and I am of course rooting for DeeDee Jonrowe, pictured with her team at left. 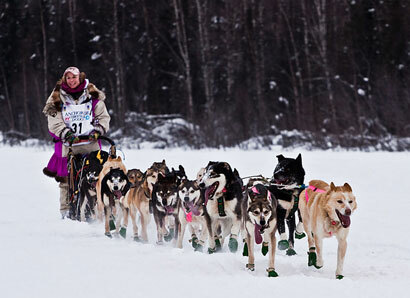 DeeDee has competed in the Iditarod since 1980 and has finished in the top ten fifteen times. Go DeeDee! In case you want to get a little more background, here's a summary of all my 2014 Iditarod posts. Last year's race was one of the most exciting ever. Be sure to check out this final wrapup, which details the wild strategy on the last day.